Girls and boys ages 11 to 14 will enjoy fun activities that develop creativity, collaboration and innovation at Crescent School’s March Break day camp programs. 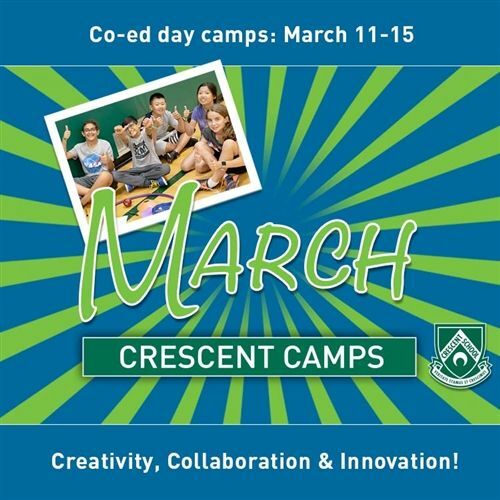 Crescent’s March Break 2019 day camp runs from March 11 to 15 at its campus located near Bayview and Lawrence in Toronto. Registration is open now. “Our March Break program allows our campers to experience athletics, arts and science, while developing skills in collaboration, leadership, creativity and innovation,” says Donna MacKenzie, Crescent Camps Director. The 2019 March Break program is called Challenge Camp. Led by qualified instructors, campers will enjoy using ingenuity and teamwork in fun challenges that include escape rooms, art/improv studios, mad science labs and more. The registration fee is $395. To register online, visit the March Break Camps page. Watch the video of Crescent Camps last summer.